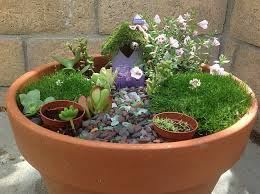 In this class you will create a wee fairy garden. Assemble wee fairy, swings, ladders, or furniture for your fairy friends to play on. Let your imagination run wild. Please bring your own live wee plants. All other supplies are provided. Plan to enter your garden in the Fairy Festival competition on July 21st! For ages 8 to 98. Kids 9 and under must register with an adult.